1. 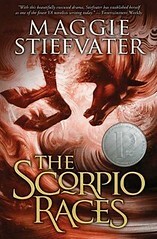 The US paperback of The Scorpio Races is officially out today. It has some cool things the hard cover doesn’t: several deleted scenes, my Printz speech, an interview with my editor, and the recipe for the November Cakes. The recipe you can already get online, but the other stuff is exclusive. It also has this new cover. 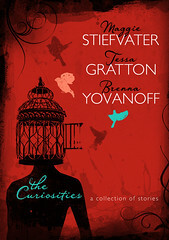 Maggie Stiefvater, Tessa Gratton and Brenna Yovanoff’s THE ANATOMY OF CURIOSITY, a companion to their earlier THE CURIOSITIES, and a conversational step-by-step guide to their writing/ critiquing process and relationship, with new original stories by the authors in first and final draft forms, again to Andrew Karre at Carolrhoda Lab, for publication in Fall 2014, by Laura Rennert at the Andrea Brown Literary Agency for Stiefvater and Gratton, and Sarah Davies at the Greenhouse Literary Agency for Yovanoff (world English). Like The Curiosities, it will involve new short fiction and doodled marginalia* from each of us, but unlike The Curiosities, we’re really digging in to the critique and revision process and making a level effort to show our thought processes at every step of the writing process. To do that, we’re going to dissect lengthy stories from each of us. 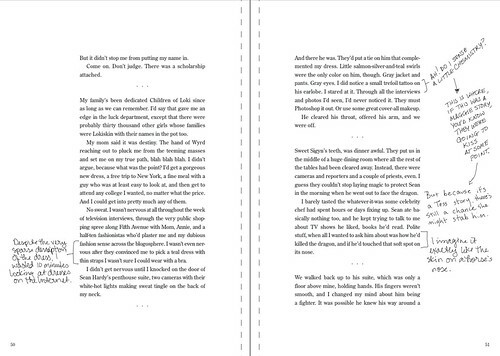 *here is what a sample page of The Curiosities looks like. 4. I did a quite extended interview with London Real and it’s available on YouTube and on iTunes. It’s an hour and a half long which means you will see more of my face than I see myself. We cover cars and fainting goats and The Dream Thieves. 5. Thus concludes my news.